By the first quarter of the 18th century, costly and unsuccessful wars had brought France almost to the brink of bankruptcy, and the economic strain was reflected in both the metallic and paper currencies. Most coins issued at this time bore no indication of denomination, leaving it to the authorities to proclaim the rate at which each was to be current. Thus, in an effort to gain much-needed revenue, France attempted to make large profits from her coinage by issuing coins at inflated ratings. However, to avoid strong public resistance, these ratings would gradually be lowered to more acceptable levels. Periodically, as the rating of a particular coin approached a more realistic value and the issue became less profitable, the cycle was begun again with a coin of a new design. It is not difficult to imagine the chaos this practice created. A specific example of such coinage manipulation can be seen in the gold louis issued from l720 to l723. The initial official rating of this coin in 1720 was 54 livres, but by the time the coin was called in and replaced with a new design in 1723 the rating had been lowered to 39 livres, 12 sols. 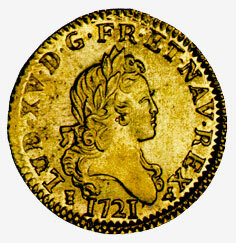 Sometimes referred to as the "John Law" louis because it was first issued under the authority of John Law, a Scottish banker who became the main financial adviser to Louis XV, the l720-23 louis circulated to a limited extent in New France, the principal French colony in North America. The coin illustrated is part of the National Currency Collection, Bank of Canada.